If this author’s dispatches from Rome can be taken as an ongoing journal of Italian politics, readers will note that the pessimistic predictions were the ones that actually played out. This is especially expressed in the rise of Matteo Salvini’s Lega, a force that won 4.1 percent in the 2013 general election but is now polling over eight times that (33.8 percent). Today the main force on the (radicalizing) right, it dominates the political agenda; its government partner, Luigi di Maio’s Five Star Movement (M5s), scored double the Lega’s vote in the March 2018 general election but now lags ten points behind it in the polls (24 percent). The government’s already precarious balance is particularly threatened by May’s European elections, in which Salvini’s party will surely win a national contest for the first time. If in some countries the ballot for the Brussels parliament brings low turnouts and large protest votes, in Italy it is taken seriously; after the last contest five years ago, new Democratic Party premier Matteo Renzi took his party’s 40 percent as a mandate for domestic reforms. And breakthrough for the Lega this time around could push Italy toward fresh elections, if Vice Premier Salvini bids to capitalize on his advantage as leader of the Right. Fearing the losses it would suffer in such a contest, the eclectic M5s has kowtowed to the hard-right Salvini. Lacking roots in historic left or right and claiming to stand for “citizens” rather than “politics,” its spell in office with the Lega has brought its most reactionary elements to the fore. Beyond bad polling news for Di Maio’s party (down eight points since its success in the March 2018 election), a series of flashpoints testing relations between the two parties have shown M5s to be the victim of its own short-termist opportunism, abandoning policy after policy to maintain ties with the Lega. The first line of Italy’s constitution declares it a “Republic founded on labor.” But as the political spotlight once again turned to the Lega leader in late January — this time, in a wrangle over whether he should be tried for kidnapping 177 illegally-detained migrants — M5s man Alessandro di Battista lamented that Italy was turning into a “Republic founded on Salvini.” Yet if Interior Minister Salvini now dominates the stage, while the needs of Italians who struggle to make it to the end of the month are pushed off the political agenda, special blame lies with the M5s itself. Long one of the party’s key “activist” faces, Battista is hardly a dissident in M5s ranks. Having left the political front line before the 2018 election, he has spent the last year touring the Americas, making only occasional political interventions. He like parliamentary speaker Roberto Fico (not a member of the executive) represents a platonic “soul” of the M5s, repeating its old slogans as if their party colleagues were not the biggest party in government. They are (rather weakly) repeating an old trick played by the Lega during Silvio Berlusconi’s rule: to be the “anti-establishment” voice within the ruling majority. Such a posture is highly unconvincing given the M5s’s numbers in the Chamber of Deputies. If during its coalitions with Berlusconi in the 1990s and 2000s the Lega — the minor partner, and at that time a Northern-only party — could angrily demand more cash for its regional strongholds, the amorphous M5s is instead trapped by its own incoherence, precariously trying to balance its various souls while also placating Salvini. Any split in the government, and the dissolution of Parliament, would risk fresh elections in which the M5s would suffer easily its biggest setback since its foundation ten years ago. On January 24 a surprise legal move linked the weakening of M5s’s position and the broader reactionary drift. After an action launched by prosecutors in Agrigento, Sicily, the Interior Minister Salvini risks trial for kidnapping, after a five-day political stunt last August in which he refused to allow an Italian coast guard vessel — the Diciotti, with 177 refugees — to dock on the island. Salvini’s parliamentary immunity demands a vote among MPs and senators to let the trial go ahead: after initially daring the courts to bring it on, Salvini now seeks M5s aid to block it. The decision is expected on Tuesday, February 19. If it might seem obvious that one government partner should protect the other, a vote to block the trial would in fact expose a deep hypocrisy in M5s. From its origins as an “anticorruption movement,” the party founded by charlatan comic Beppe Grillo had insisted that any public official who came under investigation should resign, and until 2017 its own statutes imposed such a rule on its own members. It dropped this line when M5s mayor of Rome Virginia Raggi was herself embroiled in a scandal over subcontracting, and now it seems that the stick may be bent yet further to save Salvini’s skin. Since the Berlusconi government of 1994-95 these disputes over parliamentary immunity have played a continual role in alliance formation in Rome. The intensification of an ever-present giustizialista narrative since the anticorruption trials of 1992-94 — in which the stream of day-to-day news is dominated by scandals and investigations — has done nothing to clean up public life, instead reinforcing a widely held apathy or indeed the belief that, given that all politicians are “just the same” and each party full of “bad apples,” there is nothing to be expected from the Italian state at all. At the same time, the M5s leader like premier Giuseppe Conte (an independent, and in practice a plaything of Di Maio and Salvini) has sought to counterpose the charges against Salvini to other cases of misuse of office, this being a case not of embezzlement or mishandling public funds but of mistreating migrants — this implicitly being assumed not to matter. In so doing Di Maio has calculatedly left all options open. Most Italian media forecast that his party will move to block the trial (which would certainly go ahead if M5s either abstained or voted in favor of lifting Salvini’s immunity). This has left some M5sers dissatisfied, with such figures as Carlo Sibilia (under-secretary in the Interior Ministry) and the wing of the party close to Fico speaking out against a “betrayal of the movement’s principles.” In general, however, figures directly integrated into the executive seem cooler on the idea of an outright confrontation with the Lega leader. Not only does national-level polling suggest that M5s is poorly prepared for a split and fresh elections, but it seems to be shedding votes to the Lega. Indicative was last Sunday’s regional election in Abruzzo, a central-southern region in which the Lega did not even stand in the last contest in 2014. This time it placed first (28 percent) while the M5s scored 20 percent — a similar score to five years ago, yet twenty points down on its score in this region in last year’s general election. That said, overall the Lega’s main success has been in rallying conservative middle-class voters behind its own leadership; having overtaken Forza Italia last March, Salvini’s party is now the hegemonic force on the Right. Indeed, even its advance in the South has not stopped it making a fresh bid for regional autonomy in the North. The poor Abruzzo result sparked criticism within M5s leading circles of Di Battista’s own recent interventions critical of Salvini. Since his return to Italy, serving as an aide to Di Maio, former MP Di Battista has sought to place clear yellow water (as the party’s colors might unkindly be described) between M5s and the Lega. However, M5s’s owners [sic!] — a business called Casaleggio Associates, founded by Beppe Grillo’s longtime guru — is doggedly opposed to any split with Salvini’s party. The M5s’s public exchanges over whether to allow the trial to go ahead seem most of all like a piece of political theater designed to vaunt its independence, perhaps to be topped off by an online vote among members to “ratify” whatever decision is made. This has become the modus operandi of a party whose explicit commitment to direct democracy has exposed only the poverty of such an instrument. In its opposition period between the 2013 and 2018 general elections, the M5s would usually abstain en bloc on contentious issues rather than allow their “transversal” base to be divided along political lines. Its MPs do at least now vote, though it would be hard to characterize Di Maio’s party as anything other than agnostic, seeking delay and splitting the difference even on its foundational policies like opposing the TAV high-speed rail line. Over in Britain, one of the key symbols of Gordon Brown’s dismal premiership was his quandary over whether to hold the flame for the Beijing Olympics. Rather than put his hands on it and be seen to “endorse China” he allowed the torch to be photographed hovering in front of him. M5s’s approach to Salvini is roughly analogous, for instance in the case of Infrastructure Minister Danilo Toninelli. He has obediently signed off Salvini’s moves to block migrant arrivals (it takes only the stroke of a tweet to force his hand) while silently allowing the Lega leader to take the political responsibility (or credit). That is not to deny that the M5s has a certain taste for political theater, albeit a rather inconsequential one. Di Maio’s recent visit to gilets jaunes protesters in France duly produced a hostile reaction from Emmanuel Macron, helping shore up the party’s “activist” face. M5s is, however, not exactly on the offensive against neoliberalism in the European Union, and stands far from its until recently proclaimed demand for a referendum on euro membership. When the European Commission slapped down the government’s 2.4 percent budget deficit plan, the Lega and M5s arrived at the laughable ruse of setting a 2.04 percent deficit, apparently hoping no one would be able to tell the difference. Past Italian governments’ clashes with Brussels (including Berlusconi but also Matteo Renzi) offered a similar tedious sequence of bombast, submission, and proud claims of having put up the good fight. This would be rather funnier if M5s wasn’t meant to be standing up for Italians buried in a now decades-long social crisis, characterized by low wages, mass unemployment, and (literally) crumbling public infrastructure. The Financial Times recently noted that Italy is the only EU country whose real GDP is lower than when it joined the euro twenty years ago. But beyond the noise against refugees, how is M5s actually helping those who struggle to reach the end of the month? Both M5s’s specific measure and its record in government would imply that it is not about to create a generous welfare system or still less a program offering young Italians worthwhile employment. That is not to say that it is competing in a crowded field. Its success (especially in the run up to last year’s general election) has been to present itself as “on the side” of those with no or low incomes, which could hardly be said of the center left grouped around the Democratic Party (PD). This latter party’s voters are, alongside the Lega’s and Forza Italia’s, the most hostile to the citizens’ income policy, with some figures even suggesting a referendum to block it. Indeed, while the M5s-Lega coalition seems liable to fracture, none of the political initiative is with the forces in opposition. Having scored just 18 percent in the 2018 election, the center-left is embroiled in a profound identity crisis, now that it rests largely on older and wealthier Italians. Carlo Calenda, economy minister in the previous PD-led government (he joined the party after the election) is currently bidding to launch a new anti-populist and pro-Europeanist force modeled on Emmanuel Macron’s En Marche! vehicle, integrating elements of the center-right. Within the PD, it is Lazio governor Nicola Zingaretti who at least rhetorically invokes the need to appeal to M5s voters, in his own bid to become party leader (the primary is due on March 3). His Lazio administration is based on an informal arrangement with M5s, but this seems unlikely at the national level. If the current coalition collapses, a pact between the PD and M5s is mathematically possible, yet the two parties are strongly hostile to one another. 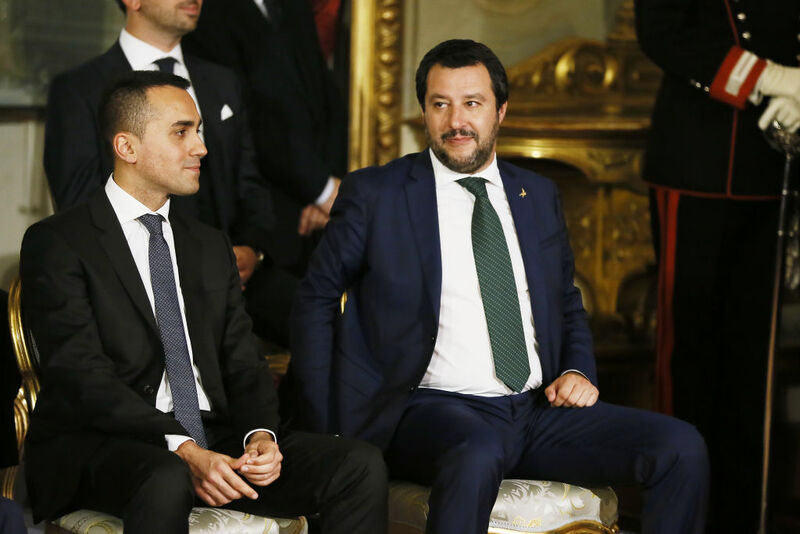 Their brief post-election coalition talks last spring seemed most of all a means by which Di Maio pressured Salvini to make a deal, and a switch of alliances would surely further undermine M5s’s internal coherence. The differences between Zingaretti, Interim Secretary Maurizio Martina. and former leader Matteo Renzi (maintaining a “neutral” stance in the primary) are more the stuff of personal clashes than they are different visions of what their party should be. This is also true of the forces to the PD’s left, unable to provide a compelling vision even at the level of M5s’s hollow promises. Faced with the unemployed forty-year-old who lives with her parents, the trader crushed by taxation, or indeed the Malian farm laborer, the Left (of whatever radical stripe) seems to lack any kind of unifying language or promise of change, able to go beyond the level of resistance movements and offer a vision of Italy that reaches beyond a shrinking “people of the Left” subculture. In the build-up to the European elections, there is something of a truce among the fractious radical left. Naples mayor Luigi de Magistris, an anti-mafia magistrate who is the country’s most prominent left-wing politician (and has long contained the M5s, in local contests at least) is planning a list based on his DeMa vehicle which also includes both the main fragments of the far-left Potere al Popolo (PaP). Clashes over Europe and the party’s formal status had caused a split between PaP and Rifondazione Comunista, but unable to run alone they have each opted to stand with De Magistris. Polling at 5 percent, they will hope to elect at least a couple of MEPs. Nonetheless, neither Salvini’s legal troubles or (limited) signs of unity on the radical left provide great room for optimism. The overall picture is, in a word, bleak. Far from the kidnapping charges against Salvini rallying Italians against his dehumanization of migrants, he has been allowed to posture as a representative of the popular will persecuted by the courts. The difficulties connected with the case have — thus far at least — been offloaded on M5s alone. As it decides this weekend on whether to let the trial go ahead, Di Maio’s party could choose to honor its own original principles, perhaps even out of a sense that Salvini was wrong to hold 177 human beings hostage. But don’t count on it.